The Tractatus Logico-Philosophicus (TLP) (Latin for "Logico-Philosophical Treatise") is the only book-length philosophical work published by the Austrian philosopher Ludwig Wittgenstein in his lifetime. The project had a broad aim – to identify the relationship between language and reality and to define the limits of science – and is recognized as a significant philosophical work of the twentieth century. G. E. Moore originally suggested the work's Latin title as homage to the Tractatus Theologico-Politicus by Baruch Spinoza. Wittgenstein wrote the notes for the Tractatus while he was a soldier during World War I and completed it when a prisoner of war at Como and later Cassino in August 1918. It was first published in German in 1921 as Logisch-Philosophische Abhandlung. The Tractatus was influential chiefly amongst the logical positivists of the Vienna Circle, such as Rudolf Carnap and Friedrich Waismann. Bertrand Russell's article "The Philosophy of Logical Atomism" is presented as a working out of ideas that he had learned from Wittgenstein. The Tractatus employs a notoriously austere and succinct literary style. The work contains almost no arguments as such, but rather consists of declarative statements that are meant to be self-evident. The statements are hierarchically numbered, with seven basic propositions at the primary level (numbered 1–7), with each sub-level being a comment on or elaboration of the statement at the next higher level (e.g., 1, 1.1, 1.11, 1.12). Wittgenstein's later works, notably the posthumously published Philosophical Investigations, criticised many of the ideas in the Tractatus. This along with the beginning of two can be taken to be the relevant parts of Wittgenstein's metaphysical view that he will use to support his picture theory of language. These sections concern Wittgenstein's view that the sensible, changing world we perceive does not consist of substance but of facts. Proposition two begins with a discussion of objects, form and substance. 2 What is the case—a fact—is the existence of atomic facts. This epistemic notion is further clarified by a discussion of objects or things as metaphysical substances. 2.0141 The possibility of its occurrence in atomic facts is the form of an object. His use of 'composite' in 2.021 can be taken to mean a combination of form and matter, in the Platonic sense. 2.027 Objects, the unalterable, and the substantial are one and the same. 2.0271 Objects are what is unalterable and substantial; their configuration is what is changing and unstable. Although Wittgenstein largely disregarded Aristotle (Ray Monk's biography suggests that he never read Aristotle at all) it seems that they shared some anti-Platonist views on the universal/particular issue regarding primary substances. He attacks universals explicitly in his Blue Book. "The idea of a general concept being a common property of its particular instances connects up with other primitive, too simple, ideas of the structure of language. It is comparable to the idea that properties are ingredients of the things which have the properties; e.g. that beauty is an ingredient of all beautiful things as alcohol is of beer and wine, and that we therefore could have pure beauty, unadulterated by anything that is beautiful." And Aristotle agrees: "The universal cannot be a substance in the manner in which an essence is…" (Z.13 1038b17) as he begins to draw the line and drift away from the concepts of universal Forms held by his teacher Plato. Here ends what Wittgenstein deems to be the relevant points of his metaphysical view and he begins in 2.1 to use said view to support his Picture Theory of Language. "The Tractatus's notion of substance is the modal analogue of Kant's temporal notion. Whereas for Kant, substance is that which 'persists,' (i.e., exists at all times), for Wittgenstein it is that which, figuratively speaking, 'persists' through a 'space' of possible worlds." Whether the Aristotelian notions of substance came to Wittgenstein via Immanuel Kant, or via Bertrand Russell, or even whether Wittgenstein arrived at his notions intuitively, one cannot but see them. The world consists of a totality of interconnected atomic facts, and propositions make "pictures" of the world. In order for a picture to represent a certain fact it must in some way possess the same logical structure as the fact. The picture is a standard of reality. In this way, linguistic expression can be seen as a form of geometric projection, where language is the changing form of projection but the logical structure of the expression is the unchanging geometric relationships. We cannot say with language what is common in the structures, rather it must be shown, because any language we use will also rely on this relationship, and so we cannot step out of our language with language. A philosophical treatise attempts to say something where nothing can properly be said. It is predicated upon the idea that philosophy should be pursued in a way analogous to the natural sciences; that philosophers are looking to construct true theories. This sense of philosophy does not coincide with Wittgenstein's conception of philosophy. 4.112 Philosophy aims at the logical clarification of thoughts. Philosophy is not a body of doctrine but an activity. A philosophical work consists essentially of elucidations. Philosophy does not result in "philosophical propositions", but rather in the clarification of propositions. Without philosophy thoughts are, as it were, cloudy and indistinct: its task is to make them clear and to give them sharp boundaries. Wittgenstein is to be credited with the invention or at least the popularization of truth tables (4.31) and truth conditions (4.431) which now constitute the standard semantic analysis of first-order sentential logic. The philosophical significance of such a method for Wittgenstein was that it alleviated a confusion, namely the idea that logical inferences are justified by rules. If an argument form is valid, the conjunction of the premises will be logically equivalent to the conclusion and this can be clearly seen in a truth table; it is displayed. The concept of tautology is thus central to Wittgenstein's Tractarian account of logical consequence, which is strictly deductive. 5.13 When the truth of one proposition follows from the truth of others, we can see this from the structure of the propositions. 5.131 If the truth of one proposition follows from the truth of others, this finds expression in relations in which the forms of the propositions stand to one another: nor is it necessary for us to set up these relations between them, by combining them with one another in a single proposition; on the contrary, the relations are internal, and their existence is an immediate result of the existence of the propositions. 5.132 If p follows from q, I can make an inference from q to p, deduce p from q. The nature of the inference can be gathered only from the two propositions. They themselves are the only possible justification of the inference. "Laws of inference", which are supposed to justify inferences, as in the works of Frege and Russell, have no sense, and would be superfluous. stands for the negation of all propositions making up . What proposition 6. really says is that any logical sentence can be derived from a series of NOR operations on the totality of atomic propositions. This is in fact a well-known logical theorem produced by Henry M. Sheffer, of which Wittgenstein makes use. Sheffer's result was, however, restricted to the propositional calculus, and so, of limited significance. Wittgenstein's N-operator is however an infinitary analogue of the Sheffer stroke, which applied to a set of propositions produces a proposition that is equivalent to the denial of every member of that set. Wittgenstein shows that this operator can cope with the whole of predicate logic with identity, defining the quantifiers at 5.52, and showing how identity would then be handled at 5.53-5.532. The subsidiaries of 6. contain more philosophical reflections on logic, connecting to ideas of knowledge, thought, and the a priori and transcendental. The final passages argue that logic and mathematics express only tautologies and are transcendental, i.e. they lie outside of the metaphysical subject’s world. In turn, a logically "ideal" language cannot supply meaning, it can only reflect the world, and so, sentences in a logical language cannot remain meaningful if they are not merely reflections of the facts. In the final pages, Wittgenstein veers towards what might be seen as religious considerations. This is founded on the gap between propositions 6.5 and 6.4. A logical positivist might accept the propositions of the Tractatus before 6.4. But 6.51 and the succeeding propositions argue that ethics is also transcendental, and thus we cannot examine it with language, as it is a form of aesthetics and cannot be expressed. He begins talking of the will, life after death, and God. In his examination of these issues he argues that all discussion of them is a misuse of logic. Specifically, since logical language can only reflect the world, any discussion of the mystical, that which lies outside of the metaphysical subject's world, is meaningless. This suggests that many of the traditional domains of philosophy, e.g. ethics and metaphysics, cannot in fact be discussed meaningfully. Any attempt to discuss them immediately loses all sense. This also suggests that his own project of trying to explain language is impossible for exactly these reasons. He suggests that the project of philosophy must ultimately be abandoned for those logical practices which attempt to reflect the world, not what is outside of it. The natural sciences are just such a practice, he suggests. At the very end of the text he borrows an analogy from Arthur Schopenhauer, and compares the book to a ladder that must be thrown away after one has climbed it. Both the first and the final proposition have acquired something of a proverbial quality in German, employed as aphorisms independently of discussion of Wittgenstein. A prominent view set out in the Tractatus is the picture theory. The picture theory is a proposed description of the relation of representation. :p44 This view is sometimes called the picture theory of language, but Wittgenstein discusses various representational picturing relationships, including non-linguistic "pictures" such as photographs and sculptures (TLP 2.1–2.225). According to the theory, propositions can "picture" the world, and thus accurately represent it. If someone thinks the proposition, "There is a tree in the yard," then that proposition accurately pictures the world if and only if there is a tree in the yard. :p53 If there is no tree in the yard, the proposition does not accurately picture the world. Although something need not be a proposition to represent something in the world, Wittgenstein was largely concerned with the way propositions function as representations. When writing about these picturing situations, Wittgenstein used the word "Bild," which may be translated as "picture" or "model". Although the theory is commonly known as the "picture" theory, "model" is probably a more appropriate way of thinking of what Wittgenstein meant by "Bild." Wittgenstein believed that the parts of the logical structure of thought must somehow correspond to words as parts of the logical structure of propositions, although he did not know exactly how. Here, Wittgenstein ran into a problem he acknowledged widely: we cannot think about a picture outside of its representational form. Recall that part of the representational form of toy cars is their size—specifically, the fact that they are necessarily smaller than the actual cars. Just so, a picture cannot express its own pictorial form. 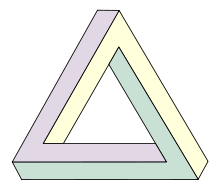 One outcome of the picture theory is that an a priori true thought does not exist. Truth comes from the accurate representation of a state of affairs (i.e., some aspect of the real world) by a picture (i.e., a proposition). "The totality of true thoughts is a picture of the world (TLP 3.01)." Thus without holding a proposition up against the real world, we cannot tell whether the proposition is true or false. Russell's theory of descriptions is a way of logically analyzing objects in a meaningful way regardless of that object's existence. According to the theory, a statement like "There is a man to my left" is made meaningful by analyzing it into: "There is some x such that x is a man and x is to my left, and for any y, if y is a man and y is to my left, y is identical to x". If the statement is true, x refers to the man to my left. Within states of affairs, objects are in particular relations to one another. :p59 This is analogous to the spatial relations between toy cars discussed above. The structure of states of affairs comes from the arrangement of their constituent objects (TLP 2.032), and such arrangement is essential to their intelligibility, just as the toy cars must be arranged in a certain way in order to picture the automobile accident. Anthony Kenny provides a useful analogy for understanding Wittgenstein's logical atomism: a slightly modified game of chess. : pp60–61 Just like objects in states of affairs, the chess pieces do not alone constitute the game—their arrangements, together with the pieces (objects) themselves, determine the state of affairs. Through Kenny's chess analogy, we can see the relationship between Wittgenstein's logical atomism and his picture theory of representation. :p61 For the sake of this analogy, the chess pieces are objects, they and their positions constitute states of affairs and therefore facts, and the totality of facts is the entire particular game of chess. We can communicate such a game of chess in the exact way that Wittgenstein says a proposition represents the world. We might say "WR/KR1" to communicate a white rook's being on the square commonly labeled as king's rook 1. Or, to be more thorough, we might make such a report for every piece's position. The logical form of our reports must be the same logical form of the chess pieces and their arrangement on the board in order to be meaningful. Our communication about the chess game must have as many possibilities for constituents and their arrangement as the game itself. Kenny points out that such logical form need not strictly resemble the chess game. The logical form can be had by the bouncing of a ball (for example, twenty bounces might communicate a white rook's being on the king's rook 1 square). One can bounce a ball as many times as one wishes, which means the ball's bouncing has "logical multiplicity," and can therefore share the logical form of the game. :p62 A motionless ball cannot communicate this same information, as it does not have logical multiplicity. His logico-atomistic metaphysical view led Wittgenstein to believe that we could not say anything about the relationship that pictures bear to what they picture. Thus the picture theory allows us to be shown that some things can be said while others are shown. :p40 Our language is not sufficient for expressing its own logical structure. :p47 Wittgenstein believed that the philosopher's job was to discover the structure of language through analysis. Something sayable must have content that is fully intelligible to a person without that person's knowing if it is true or false. In the case of something's inability to be said, such as the logical structure of language, it can only be shown. A proposition can say something, such as "George is tall," but it cannot express (say) this function of itself. It can only show that it says that George is tall. Wittgenstein concluded that the Tractatus had resolved all philosophical problems. The book was translated into English by C. K. Ogden with help from the teenaged Cambridge mathematician and philosopher Frank P. Ramsey. Ramsey later visited Wittgenstein in Austria. Translation issues make the concepts hard to pinpoint, especially given Wittgenstein's usage of terms and difficulty in translating ideas into words. The Tractatus caught the attention of the philosophers of the Vienna Circle (1921–1933), especially Rudolf Carnap and Moritz Schlick. The group spent many months working through the text out loud, line by line. Schlick eventually convinced Wittgenstein to meet with members of the circle to discuss the Tractatus when he returned to Vienna (he was then working as an architect). Although the Vienna Circle's logical positivists appreciated the Tractatus, they argued that the last few passages, including Proposition 7, are confused. Carnap hailed the book as containing important insights, but encouraged people to ignore the concluding sentences. Wittgenstein responded to Schlick, commenting: "...I cannot imagine that Carnap should have so completely misunderstood the last sentences of the book and hence the fundamental conception of the entire book." 3.0321 Though a state of affairs that would contravene the laws of physics can be represented by us spatially, one that would contravene the laws of geometry cannot. A more recent interpretation comes from the New Wittgenstein family of interpretations under development since 2000. This so-called "resolute reading" is controversial and much debated. The main contention of such readings is that Wittgenstein in the Tractatus does not provide a theoretical account of language that relegates ethics and philosophy to a mystical realm of the unsayable. Rather, the book has a therapeutic aim. By working through the propositions of the book the reader comes to realize that language is perfectly suited to all his needs, and that philosophy rests on a confused relation to the logic of our language. The confusion that the Tractatus seeks to dispel is not a confused theory, such that a correct theory would be a proper way to clear the confusion, rather the need of any such theory is confused. The method of the Tractatus is to make the reader aware of the logic of our language as he is already familiar with it, and the effect of thereby dispelling the need for a theoretical account of the logic of our language spreads to all other areas of philosophy. Thereby the confusion involved in putting forward e.g. ethical and metaphysical theories is cleared in the same coup. Wittgenstein would not meet the Vienna Circle proper, but only a few of its members, including Schlick, Carnap, and Waissman. Often, though, he refused to discuss philosophy, and would insist on giving the meetings over to reciting the poetry of Rabindranath Tagore with his chair turned to the wall. He largely broke off formal relations even with these members of the circle after coming to believe Carnap had used some of his ideas without permission. Alfred Korzybski credits Wittgenstein as an influence in his book, Science and Sanity: An Introduction to Non-Aristotelian Systems and General Semantics. The Tractatus was the theme of a 1992 film by the Hungarian filmmaker Peter Forgacs. The 32-minute production, named Wittgenstein Tractatus, features citations from the Tractatus and other works by Wittgenstein. In 1989 the Finnish artist M. A. Numminen released a black vinyl album, The Tractatus Suite, consisting of extracts from the Tractatus set to music, on the Forward! label (GN-95). The tracks were [T. 1] "The World is...", [T. 2] "In order to tell", [T. 4] "A thought is...", [T. 5] "A proposition is...", [T. 6] "The general form of a truth-function", and [T. 7] "Wovon man nicht sprechen kann". It was recorded at Finnvox Studios, Helsinki between February and June 1989. The "lyrics" were provided in German, English, Esperanto, French, Finnish and Swedish. The music was reissued as a CD in 2003, M.A. Numminen sings Wittgenstein. Logisch-Philosophische Abhandlung, Wilhelm Ostwald (ed. ), Annalen der Naturphilosophie, 14 (1921). Werkausgabe (Vol. 1 includes the Tractatus). Frankfurt am Main: Suhrkamp Verlag. Both English translations of the Tractatus include an introduction by Bertrand Russell. Wittgenstein revised the Ogden translation. A manuscript version of the Tractatus, dubbed and published as the Prototractatus, was discovered in 1965 by Georg Henrik von Wright. ↑ Nils-Eric Sahlin, The Philosophy of F. P. Ramsey (1990), p. 227. ↑ Bertrand Russell (1918), "The Philosophy of Logical Atomism". The Monist. p. 177, as published, for example in Bertrand Russell (Robert Charles Marsh ed.) Logic and Knowledge Accessed 2010-01-29. ↑ "Blue Book on Universals citation". Blacksacademy.net. Retrieved 2011-12-10. ↑ "Wittgenstein's Logical Atomism (Stanford Encyclopedia of Philosophy)". Plato.stanford.edu. Retrieved 2011-12-10. ↑ Kenny 2005:p47 Might need an additional citation here. ↑ "Descriptions (Stanford Encyclopedia of Philosophy)". Plato.stanford.edu. Retrieved 2011-12-10. ↑ Biletzki, Anat & Matar, Anat (2002-11-08). "Ludwig Wittgenstein". Stanford Encyclopedia of Philosophy. http://plato.stanford.edu/entries/wittgenstein/#Bio: Stanford Encyclopedia of Philosophy Editorial Board. ↑ Richard H. Popkin (November 1985), "Philosophy and the History of Philosophy", Journal of Philosophy, 82 (11): 625–632, doi:10.2307/2026418, JSTOR 2026418, Many who knew Wittgenstein report that he found it extremely difficult to put his ideas into words and that he had many special usages of terms. ↑ Crary, Alice M. and Rupert Read (eds.). The New Wittgenstein, Routledge, 2000. ↑ Hintikka 2000, p. 55 cites Wittgenstein's accusation of Carnap upon receiving a 1932 preprint from Carnap. ↑ "M.A. Numminen – The Tractatus Suite". Discogs.com. Retrieved 16 March 2015. 1 2 R. W. Newell (January 1973), "Reviewed Work(s): Prototractatus, an Early Version of Tractatus Logico-Philosophicus", Philosophy, 48 (183): 97–99, doi:10.1017/s0031819100060514, ISSN 0031-8191, JSTOR 3749717. Ray Monk, Ludwig Wittgenstein, the Duty of Genius, Jonathan Cape, 1990. Zalabardo, José (2015). Representation and Reality in Wittgenstein's Tractatus. Oxford University Press. ISBN 9780198743941.